COOL (but SAD! ): Alana Holler. Have you ever seen a 6 year old talk like this before? | Everything is cool. COOL (but SAD! ): Alana Holler. Have you ever seen a 6 year old talk like this before? This is quite literally – UN-BE-LIE-VAB-LE. Worried as we are about this…cute(?) little girl from Alabama, we can’t stop watching her. Where did she learn to talk like those women on Bridezilla? 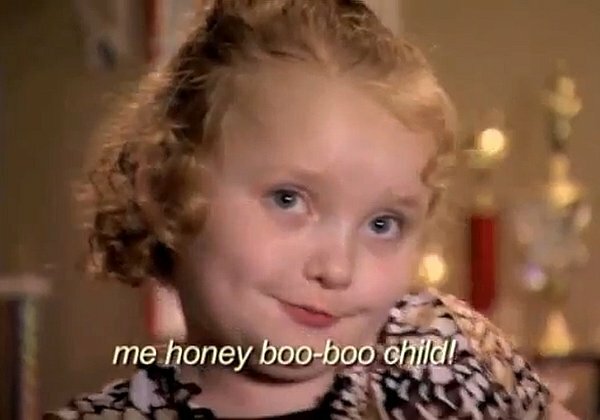 I have become obsessed with honey-boo-boo-child and the energetic dance demonstrations by Mommy Dearest. Incredible. Cute? That child is not cute. She is about as ignorant as that white trash momma of hers. if you can call a 6 year old child ignorant regardless of HOW they talk then I would love to see the cloth you are cut from.